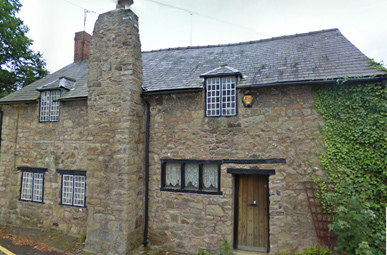 Founded in 1575 (earliest recorded mention 1618) by Doctor Lloyd, Vicar of Ruabon. Ruabon Grammar school was referred to as an Endowed Grammar school due to its reliance on wealthy endowments to educate a select number of boys in the Ruabon parish. 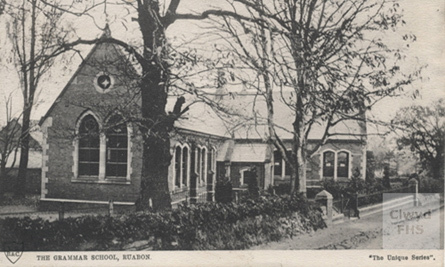 The School was housed in a building in the Churchyard which still survives to this day. The school continued, with a number of day traveller students and dormer students – the education was provided by Vicars and religious men of the parish. The first mention of a dedicated schoolmaster comes in 1710 as a Mr Thomas Evans. The following men to lead the school are all extremely well educated graduating from Oxford or Cambridge but still deeply devoted to providing education in a religious context. Endowments to the school started to see a decline in this period. Left to a determined Mr George Bagley as Schoolmaster he fought hard to keep the school’s reputation even going as far to build new kitchen facilities and sleeping accommodation out of his own pocket. The Schools failing reputation and underfunding soon saw Bagley replaced with Alfred Lee Taylor, a Cambridge graduate and ordained priest. Seeing the current school as unfit for purpose due to the cramped conditions and unhealthy damp problems, Taylor begged for a new school building to be constructed. A deal was struck with the local gentry, Sir Watkin Williams Wynn, who donated the land and provided money for the building of a new school, the building was complete in 1858 (preserved frontage of lower school). The school now became a thriving hub attracting students from outside the parish. Under new arrangements that saw the end of endowment schools, Ruabon became the first ‘County School’ in Wales in 1894 now receiving money direct from Denbighshire County. 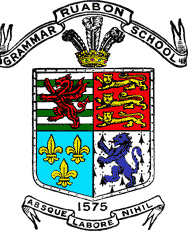 Although technically a county school the school was still referred to as a Grammar School. Remaining under the headship of Alfred Lee Taylor, the School became renowned for is reputation and strong traditional values. Later under the headship of J. R Roberts the schools numbers swelled to almost 100 and demand for an extension was growing, the outbreak of the First World War put pay to these ambitions, at the time and the school mourned the heavy loss of its ‘old boys’ loosing 10 ex-students during the First World War, a monument to these was erected in the Hall of the school. Following the War there was a re-emergence of the demand for an extension and yet again a new Headmaster was at the helm of the ship, Reverend D. J Bowen. In this time the idea of a Girls school was resurrected, and during the extension work to the school a separate Girls school was founded. Major remodelling and extensions to the school were completed in 1927 and later in 1938 with new classrooms, workshops and laboratories added and arranged around a large quadrangle. The School never lost its strong sense of morals and religious sentiment with prayers held before lunch in the hall everyday, given in Latin, English, French and Welsh. The School had a strong sense of its history, and everyone who entered the front door was confronted by a large terracotta shield emblazoned with the motto ‘Absque Labore Nihil’/ ‘Nothing without Work’ (Now placed in Upper school library corridor). The School was divided into four competing houses ‘Glwyndwr, Madoc, Offa, Wynnstay’ with fierce rivalries as a consequence. The Grammar school went on to teach until 1967 under the guidance of Eifion Ellis, producing a number of notable students. Founded in 1922, up until this date there had been no secondary education provided for girls in the Parish, for those who could afford it they would have to travel to Llangollen. The proposal was for the creation of a separate Girls Grammar school on a different site. With financial restraints hampering all efforts it was agreed that the Girls school could use land at the back of the boy’s school for a yearly rent. With little money the girls school was created out of three ex-military wooden huts, it was the very nature of this temporary school that would go on to define the school and live long in the memories of former students. The School was opened by Margaret Lloyd George wife of the Great First World War Prime Minister. The school was designed to educate 180 students, but by 1946 that had climbed to almost 300 with many new huts having to be sought to take the strain of this ever popular school. The question of shared facilities with the well provisioned boy’s school next door was continually raised by the Girl’s school, and continually dismissed by the Boy’s school. The School was rightly proud of the education it provided, even in such difficullt and confined spaces. The Girls like the boys next door were divided into the same 4 houses of Glwyndwr, Madoc, Offa and Wynnstay. With numerous sporting rivalry’s battled out of the school field on opposite side of the road reached through a cutting in Offas Dyke. In 1953 after 30 years of delay work started on building a new brick school to house the girls on the hill above the boys school (Current Ysgol Rhiwabon site) a new canteen, Gym, examination hall and music room. In 1964 the question of amalgamating the two schools was discussed and agreed, the two schools became one with very little changes to how they were run with a shared headship of Mr Eifion Ellis (Boys School) and Mrs Ethel Wood (Girls School). In 1967 following the abolition of the 11 plus examinations, the county education committee decided to create a Comprehensive school out of the old Ruabon Grammar School placing Mr Eifion Ellis as the headmaster of the whole school site (Both sides of the road). 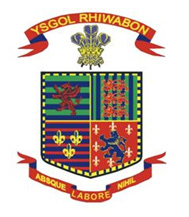 The quick succession of amalgamation and abolition of the Grammar schools led to the creation of Ysgol Rhiwabon a mixed 11-16 comprehensive school with 6th form. The Upper and Lower school sites continued to be used in tandem up until 2003, when the Lower school site was sold for development with only the historic 1853 frontage being saved. a Rampant Welsh Dragon in One quarter, three lions of England in another, the fleur-de-lis of France in another and a rampant Blue lion; the shield of Dr. David Powell (believed to be the founder of the school). Unusually the school features the feathers of the Prince of Wales which were granted use by Prince Charles on his visit to the school in 1623. Gareth Valentine , composer, conductor and musical director.